Before I begin, I know what you are thinking. 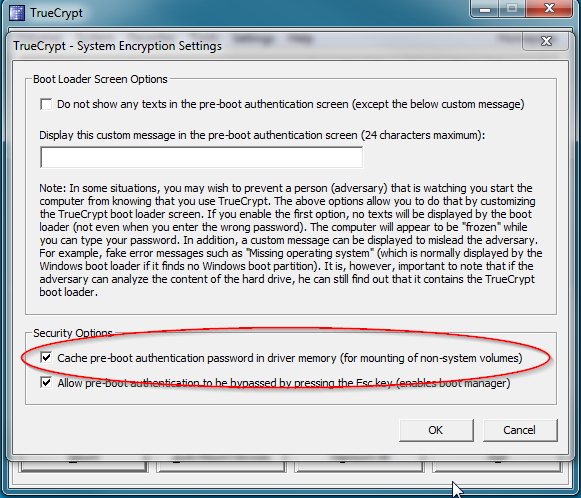 If you want your Truecrypt volume to be mounted without a password, why even have an encrypted Truecrypt volume? It doesn't sound very secure. You are right, and that would be a valid question. I would say that you should only use this on computers that are protected with full disk encryption already. 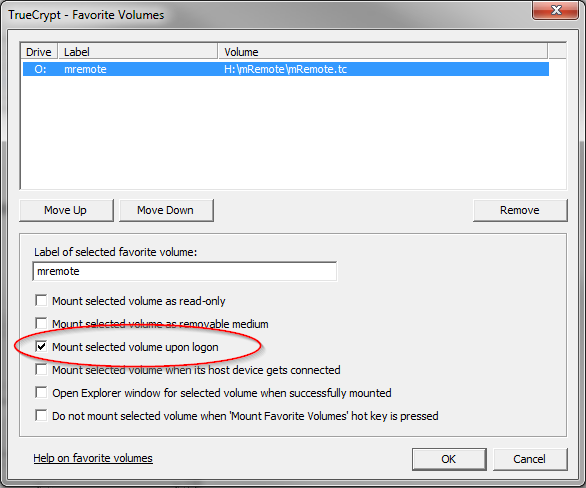 If you don't use full disk encryption, typing your password in once to mount a volume isn't going to kill you. So let's say that you have full disk encryption configured already, so auto-mounting non-system Truecrypt volumes automatically isn't a huge security concern for you. Well there are two ways of doing it depending on if your non-system Truecrypt volume uses the same password/keyfiles as your system encrypted drive or not. 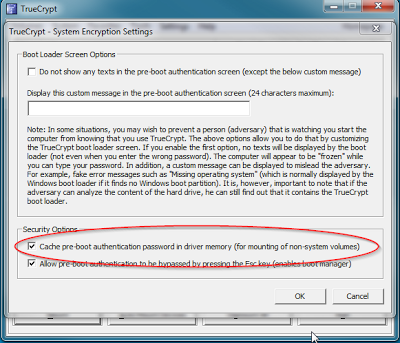 Now when you reboot, Truecrypt will cache your credentials when you decrypt your system drive in driver memory, and will use those credentials to mount your non-system volumes when you logon. Pretty cool right? So what if your non-system volume uses a different password? That is the problem I had on my home computer. The system encryption password is different because I need to share it with my wife. However, the non-system volume I want mounted uses a more complex password that I don't share with my wife (Sorry Honey). I don't have an issue with her looking in the volume because it only holds media files, however if someone breaks into my house and steals my NAS where that volume is stored, I don't want them to be able to access it. The way I have that mounted is via a batch script I wrote. Truecrypt has several command line options, so I wrote a script using those options to mount the drive when I first logon using a scheduled task. 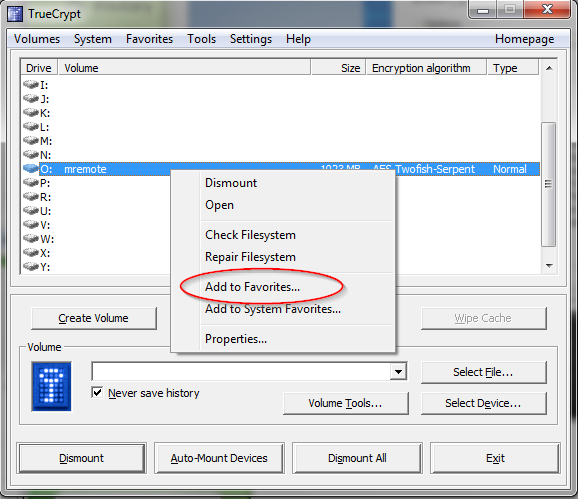 Before running the script, I recommend setting your non-system volume as a Favorite so Truecrypt always mounts it to the correct drive letter. Be sure to change the above information to fit your situation. 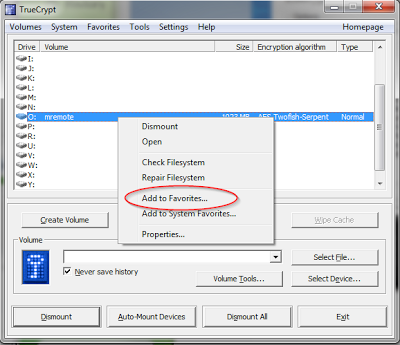 That's it, now when my wife or I login to our computer, the non-system Truecrypt volume is mounted and shows up like a regular drive. Now there is a problem with the password being stored in plain text in your batch file. Because of that I would say you should only do this on a computer that you use, or if you share it like I do with my wife, you trust them. If that isn't the case, then you should skip using the script method. 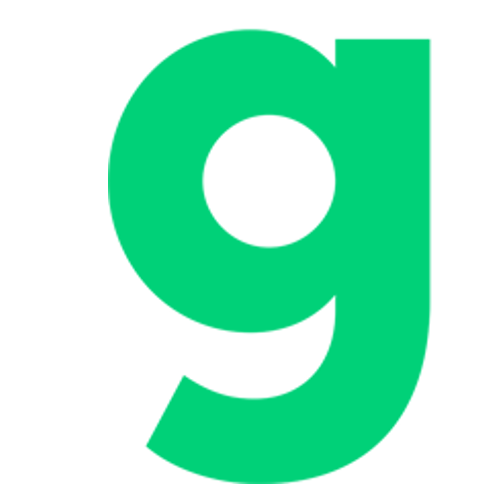 What do you think about auto-mounting encrypted volumes? Good idea or pointless? Let us know your thoughts in the comments.